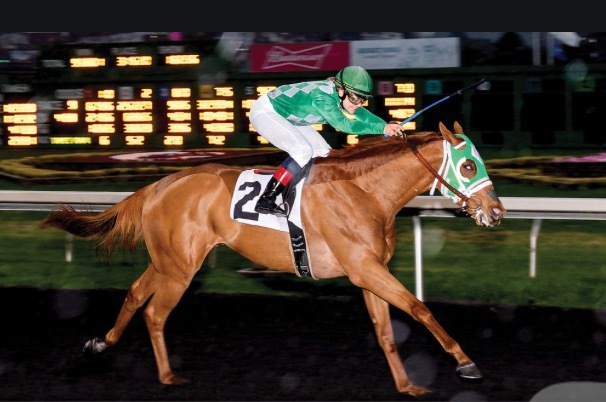 It takes athleticism, strength, determination and perseverance for a person to become a horse racing jockey. It takes discipline, intelligence, determination, and well, perseverance for a person to master the eight years of school work to become a veterinarian. Confused as to drawing parallels between being a jockey and being a vet? What if I told you there was someone in the process of being both? Hard to believe perhaps, but it’s true. Meet Ferrin Peterson – a jockey in Northern California, as well as a fourth-year veterinary student at U.C. Davis. Peterson is truly an amazing person, combining intelligence, determination, perseverance, as well as personality and charm in becoming adept at pretty much everything she does. I have covered horse racing for over 30 years and one of the best things about the sport is the people are as down to earth and real as you can find. There are no pretenses and I’ve established a lot of good friendships. Peterson is among the most enjoyable I’ve had the chance to talk with and that’s not to demean others but a testament to the type of person she has become. How did she get to this point at 26-years-old? Growing up in Roseville, Peterson was around horses growing up and rode, first English, followed by Dressage. After graduating from Oakmont High School, Peterson went to the University of Cal Poly, San Luis Obispo and took her horse with her so she could continue to ride in college while earning a degree in Animal Science. Oh, I forgot to mention she was a pole vaulter at Oakmont, setting a school record that still stands. She took her track and field talents to Cal Poly where she competed as well. But in the back of her mind she aspired to be a jockey, something that didn’t jive with family desires. “The vet school option happened, and I decided I wanted to be a track vet,” said Peterson. Ironically, it was while attending veterinary school at the University of California, Davis that her jockey dreams begun to come to fruition. After that, she went to work for trainer Ellen Jackson, helping break horses. An exercise rider for Jackson further helped Peterson learn the ropes of being a jockey. The key for any jockey to get mounts, especially a new one, is to show up in the mornings to work horses for the trainers. Be seen and show them you have what it takes. It’s a grind for jockeys that live in the area, but when you are in school in Davis and need to get to Golden Gate Fields in Albany daily, it gets a lot tougher. Once back at school, she works at the Clinic until 7 p.m. or so. Sometime the shifts may go later and are followed by studying and then to bed before doing it all over again the next day. Weekends are a time when students can get extra studying done and that’s the case for Peterson, but with a twist. All the hard work has paid off, but not without some trying moments. School has demanded internships and Peterson has traveled the world learning. She has spent time in Kentucky, New York, Japan, Hong Kong and most recently Dubai, working in the Dubai Equine Hospital, which is owned by Sheikh Mohammed. Each time she has been gone, her jockey career took a back seat and with a lot of trainers living by the “what have you done for me lately,” creed, her riding suffered. Trainer Aggie Ordonez stuck by Peterson and it paid off when she rode her first winner – Lovely Lioness at Golden Gate – on March 11. Ordonez then gave Peterson a dream – a mount at Del Mar on Chocolate Goddess. One overlooked aspect of Peterson’s double life is how her riding portrays the sport. Animal rights organizations are always quick to condemn horse racing as cruelty to the horses. Yet in Peterson we have a person set on saving animals competing in the sport. The sky seems to be the limit for Peterson as her credentials from her schooling and internships seem to call for success as a vet. But as to where she wants to be in five years….? https://harrisfarms.com/wp-content/uploads/2016/03/harrislogo.png 0 0 none https://harrisfarms.com/wp-content/uploads/2016/03/harrislogo.png none2019-01-21 20:28:362019-02-26 13:51:42Ferrin Peterson – Great person, jockey, soon to be vet!! !